Maine has many haunted places like other states in New England that boast similar haunted reputations. For those open to the public, these haunted places in Maine are great areas to experience paranormal activity firsthand. Named by Coastal Living as one of the top 15 haunted lighthouses in the United States, the Seguin Island Light Station broadcasts the island's location in Bath, Maine. George Washington commissioned the light station in 1795, making it the second oldest lighthouse in Maine. Coastal Living reports a lighthouse keeper and his wife lived in the lighthouse, which was three miles off the mainland. He gave her a piano but only one piece of sheet music. Because they couldn't get to the mainland throughout the winter to get new music, the wife played the song over and over. It drove her husband insane. He killed his wife and himself (and the piano) with an axe. Reports of paranormal activity there include the piano playing as well as sightings of the lighthouse keeper himself. The lighthouse is located on Seguin Island. You can get to the island by private boat, charter ferry, or helicopter. According to the Daily Meal, in the 1940s a young couple was traveling along Brownville Road on their way home from their honeymoon. The couple's car overturned in a ditch. The man went to get help, leaving his young wife by the car. When he returned, she was gone. The car is still there lying on its roof in the ditch. Apparently, so is the young newlywed. People report encountering a white apparition of the lady walking along the road near the green bridge. She has become known as The White Lady of Brownville Road. A Kennebunkport inn and spa, the Captain Lord Mansion turned 200 in 2014. According to the Captain Lord Mansion website, a wealthy shipbuilder named Nathaniel Lord built the house, which he completed in just seven months in 1814. He died a year after the house's completion. He had been confined for months in the mansion due to illness, and he died there as well. Lord's family remained in the home. In the 1970s, it was converted into a bed and breakfast by its current owners. A woman in a white nightgown floats throughout the building, appearing in particular on a spiral staircase. Many believe she is Nathaniel Lord's widow, who raised nine children and never remarried. The Captain Lord Mansion is located at 6 Pleasant Street in Kennebunkport, Maine. An American castle is always an interesting sight, but it grows even more noteworthy if it has a ghost. Such is the case of Beckett Castle, a private home in Cape Elizabeth. True Hauntings of America reports the castle's builder and original owner, a publisher and poet named Sylvester Beckett, built the castle in 1815, and he haunts it to this day. He appears as a blue ball of light to visitors. Guests also report cold drafts, doors that open by themselves, and having their covers yanked off in the middle of the night, indicating that Mr. Beckett must be something of a prankster. The castle is privately owned and not open to the public. It is located in Cape Elizabeth, Maine. It is not uncommon to hear reports of paranormal activity in jails and prisons due to the violence that often erupts in such places. It appears that for at least one prison in Maine, this is true. Haunted Places notes the currently occupied Maine State Prison in Warren is haunted. Could Equipment From an Old Prison Be the Cause? While the prison is a modern facility, many believe that the paranormal activity may be connected with equipment brought over from an older prison when the new facility opened. The activity centers around the Industry Building, where people report creepy feelings, seeing apparitions, and the sensation of being watched. The prison is located in Warring, but it isn't open for public tours or paranormal investigations. White lady apparitions are fairly common, such as the white lady you'll find at the Museums of Old York in York, Maine. The property is one of the United States' earliest English settlements. People report seeing a friendly "white lady" in the Historical Society building. She opens and closes doors, causes inexplicable cool breezes, and sometimes goes across the street to the elementary school to play with the children at recess. The Historical Society visitor services is located at 3 Lindsay Road in York. Visitors can take a self-guided or a guided historical tour. Located in Windham, Maine, the Anderson Cemetery is a well-known local haunt according to the Maine Ghost Hunters. Graves in the family cemetery date back to the 1700s. Visitors to the cemetery report a host of strange occurrences, including apparitions, odd mists, orbs, and strange sounds. An area at the back of the cemetery, dubbed "the den," is said to be inhabited by a male spirit who can be hostile towards visitors. The cemetery is open to the public, and it is located off of River Road in Windham. Roadside America reports people in Bucksport, Maine, often attribute bad luck to the cursed tomb of Colonel Buck. Colonel Johnathan Buck was the founder of Bucksport. His tomb, which is in the Buck Cemetery, has a stain that resembles a woman's foot in a stocking. People call this the "Witch's foot." According to the legend, Buck burned a witch and her leg and foot rolled out of the fire. The son of the witch he burned cursed Buck, saying, "Your Tomb shall thee bear the mark of a witch's foot, for all eternity!" Much to his family's surprise, a foot appeared on his tomb. According to reports, the family has tried to clean the stone and to replace it, but the foot always reappears. Of course, this is just a monument to Buck, and his tombstone is in another part of the cemetery. There is no foot on it. 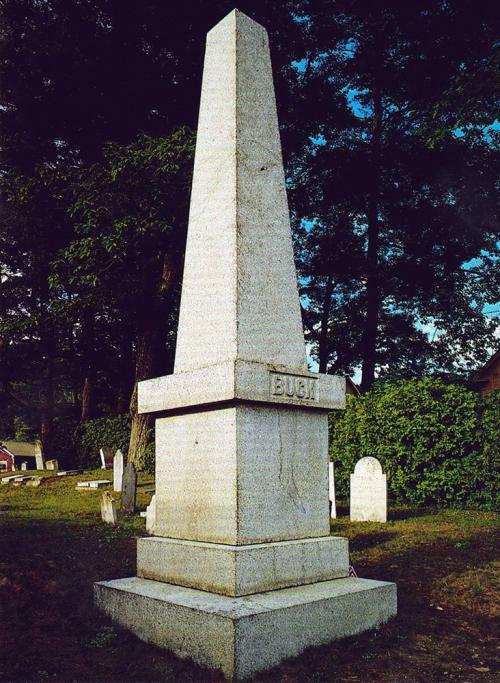 The monument - and the foot - is located in Buck Cemetery on Main Street in Bucksport, Maine. According to an article in the Bangor Daily News, the Strand Cinema in Skowhegan, Maine has its share of spooky happenings. Reports include apparitions of a woman who appears and disappears, strange sounds throughout the theater, objects moving on their own, and even the occasional possession by an angry spirit. The theater opened in 1929. According to the legend, a woman who lived above the theater died in her home, and now she haunts the theater. The Strand remains an active cinema, open to the public. It is located at 19 Court Street in Skowhegan. This 5,000 square-foot mansion was built in 1801. Located in Portland, the McLellan House and LDM Sweat Memorial Galleries are named in Mysterious Destination Magazine as a haunted location along Maine's "Mystery Coast." The mansion, along with its neighbor the Charles Q. Clapp house, boasts at least two ghosts, one male and one female according to Mysterious Destination. The houses were built in the early to mid-1800s and are now part of the Portland Art Museum. Haunted Houses notes paranormal events in the two homes, mostly apparitions of the male and female spirits who may be upset over renovations to their dwellings. The mansion is located at 95 Spring Street in Portland. Both homes are part of the Portland Art Museum's permanent collection and are therefore open to visitors. Maine is just a small part of New England, a much larger area with a great deal of reported hauntings. States like Rhode Island and Massachusetts are also home to a great deal of reported activity. If you're in the area, check out some of Maine's most notorious haunts.